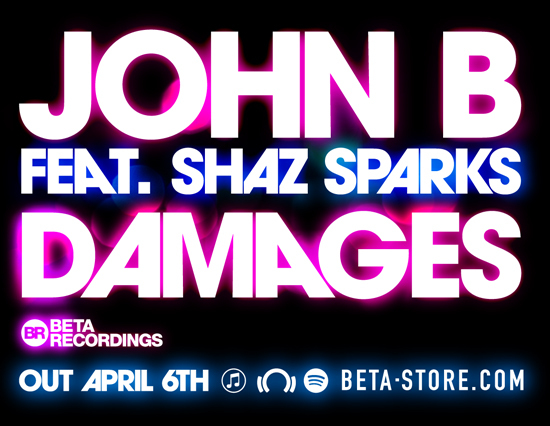 John B ft. Shaz Sparks "Damages" OUT NOW! John B is one of electronic music’s most distinctive, creative and consistent contributors. Splicing genre DNA like a modern mad scientist. His latest offering 'Damages' featuring the ethereal vocals of Shaz Sparks, is true testament to this. 'ANTHEMIC' is the only way to describe this slice of BIG ROOM D&B. John's razor sharp production is musically monstrous as always, while Shaz's voice lends an other-worldly essence to the proceedings. Next up is Johns's Deep House, mix which slows everything down but keeps the vibe large. Then lastly the package comes with a 'Live Mix' for your listening pleasure.